One of the most important questions facing scholars of China is how Chinese society is held together. It is now well known that China has been marked by great diversity. In the realm of social customs, not only were there broad regional or class differences, but also, at a local level, the people in one village might adopt a different set of practices from those of neighboring communities. Yet the majority of these varied practices seems to have fit within a frame that was distinctly Chinese. Thus scholars must also ask how people of dissimilar occupations and economic interests, living in widely separated parts of the country, came to recognize and act on a common set of cultural beliefs. Explaining the variations in Chinese society requires minute knowledge of local conditions. Explaining the uniformities requires historical understanding of the processes involved in the spread of ideas and practices and the ways by which some came to be considered standard. Given the available sources on Chinese society, neither of these tasks is simple. The study of kinship and kinship organizations provides one of the best ways to approach the coexisting uniformities and variations of Chinese society. 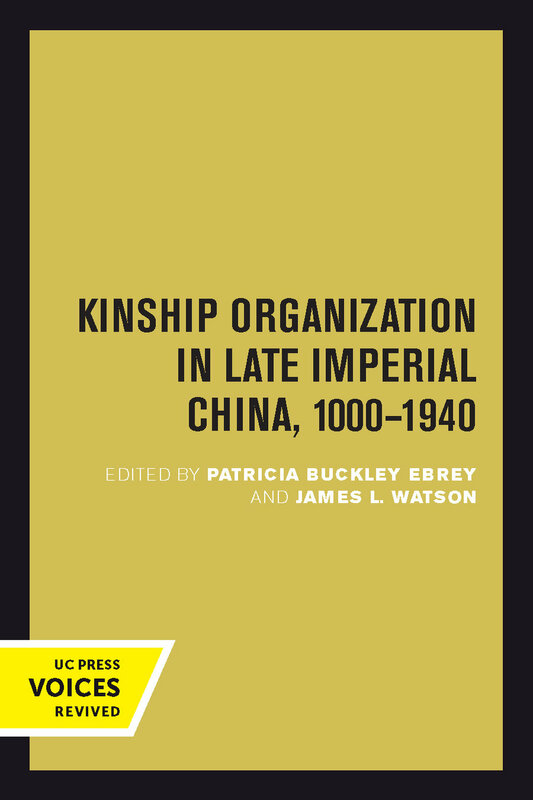 This edited volume is the collaboration of historians and social scientists, and this collaboration is required if we are to learn enough about kinship in Chinese society to explain both the uniformities and the variations. The substantive papers are all written by historians, but these historians have raided the stock of anthropological terms, models, and theories, tried to use technical terms in a consistent and well-defined way, implicitly addressed anthropologists on the issues that seem to fascinate them, and responded to the suggestions and criticisms of the anthropologists who have read their papers. At the same time, however, they remain historians and do not ignore the types of issues (such as historical context and change over time) with which historians have always dealt. The editors believe that this type of collaboration has distinct advantages over the more usual approach to transcending disciplinary boundaries by placing articles by historians and social scientists side by side in the same volume. If we have been successful, social scientists should find issues of interest in the chapters, and historians should find them full of the substance of history and not too long-winded in the belaboring the obvious. This title is part of UC Press's Voices Revived program, which commemorates University of California Press’s mission to seek out and cultivate the brightest minds and give them voice, reach, and impact. Drawing on a backlist dating to 1893, Voices Revived makes high-quality, peer-reviewed scholarship accessible once again using print-on-demand technology. This title was originally published in 1986. Patricia Ebrey is the Williams Family Endowed Professor in History at the University of Washington. James Watson is the John King and Wilma Cannon Fairbank Professor of Chinese Society in the Department of Anthropology, Emeritus, at Harvard University.